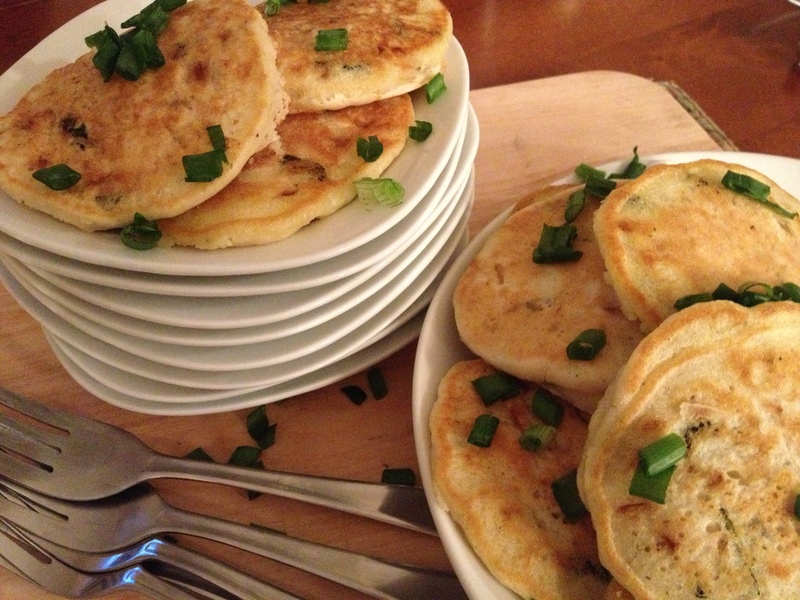 Sweet white onions and a bit of fresh mint are the perfect filling for these tiganites and I’ll let you in on a secret that will really pump up the flavors- sweat your onions before adding them to the batter. 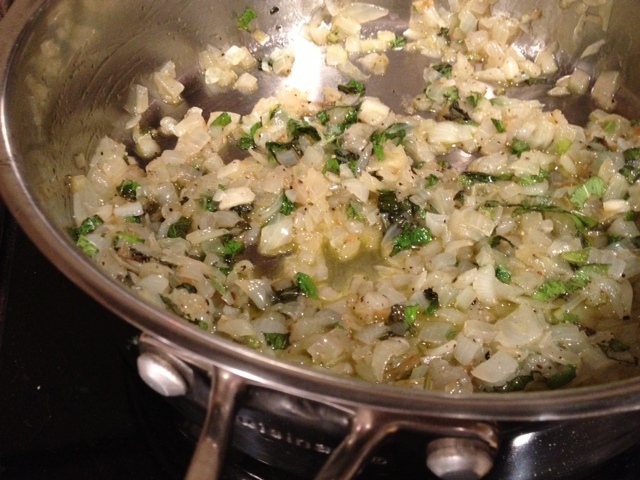 Sweating, not frying or sautéing, the onions makes them soft and sweet. The savory tastes combined will make these a favorite! To sweat the onions, you’ll need a pan with a tight fitting lid. This method uses only a small amount of olive oil, much less than sauteing or frying. And it’s important to use very low heat throughout this process. Cook the onions, covered over low heat, for about 20 minutes. 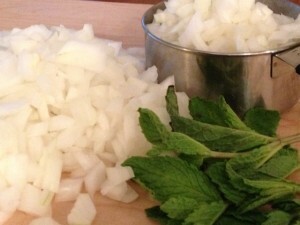 Once the onions are soft and translucent, take the pan off the heat and add the chopped mint. Adding the mint at the end preserves the fresh bright flavors of the herb. And remember, the onions will cook down significantly. For 4 cups of raw chopped onions, you’ll end up with just around a cup and a half of cooked onions. When I have it, I like to use bubbly or sparkling water in this recipe. 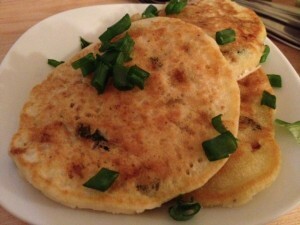 It makes a lighter, fluffier pancake but you can certainly use plain water with very good results. I also use self-rising flour when possible. Again, if it’s not available, all-purpose flour works just fine too. 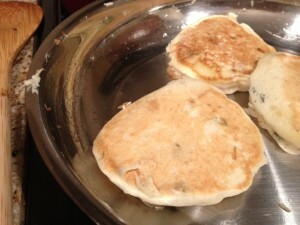 To fry the pancakes, use about a tsp of oil per batch. I use about 1/4 to 1/3 of a cup of batter per pancake. Cook about 2 minutes on each side until golden brown. Because of the small amount of oil, you really won’t need to drain the pancakes after cooking. These really are so tasty I always end up eating one or even two hot right from the pan! Heat pan on low and add 1/4 cup olive oil. Add chopped onions, stir well and cook uncovered for 2 minutes. Stir again and cover pan tightly. On very low heat, cook the onions for 20 minutes until they are soft and translucent. Remove from the heat and add chopped mint and 1/2 tsp salt and ground pepper. Set aside to cool for at least 15 minutes. You can do this step up to 3 days ahead of time if you’d like. Mix flour, 1/2 tsp salt and water together in a medium bowl until you get a thick batter. Do not over mix, just stir until ingredients are well combined. Add cooked onion mixture and combine gently. 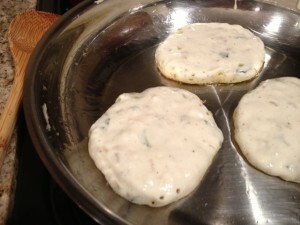 To fry the pancakes, use about a tsp of oil per batch. Heat pan on low/med heat and add about 1/4 to 1/3 of a cup of batter per pancake to hot oil. Cook about 2 minutes on each side until golden brown. Serve them warm from the pan or room temperature. Perfect stacked for dinner or packed for lunch, I like to top them with chopped spring onions or roasted red peppers and my dad loves them with a dollop of Greek ketchup. You’ll be sure to find others I’m sure! Quick note – if you have extra batter, it will keep in the refrigerator for up to a week. When you want to use it again, make sure to mix it well as the water will have come to the top. The onion flavor is a bit more intense but just as delicious and it’s the perfect quick fix for when friends drop by. They should be light and fluffy. Couple of questions – did you use bubbly or flat water? did you use self rising or all purpose flour? Bubbly or sparkling water and self-rising flour give the fluffiest results but even using flat water and AP flour, they shouldn’t be gooey. I think perhaps the heat might have been a bit too high. Then the outside browns but the inside doesn’t get enough time to cook. Try to keep the heat on medium-low. It takes me about 2 minutes on each side at this temperature if that helps you gauge your pan heat. Let me know if that help? Self Rising Flour and All Purpose Flour are NOT interchangeable! Self Rising Flour already contains a leavening agent, that’s why it has the name “Self” Rising. All Purpose Flour needs to have Baking Powder added to it to make it the equivalent of Self Rising Flour. 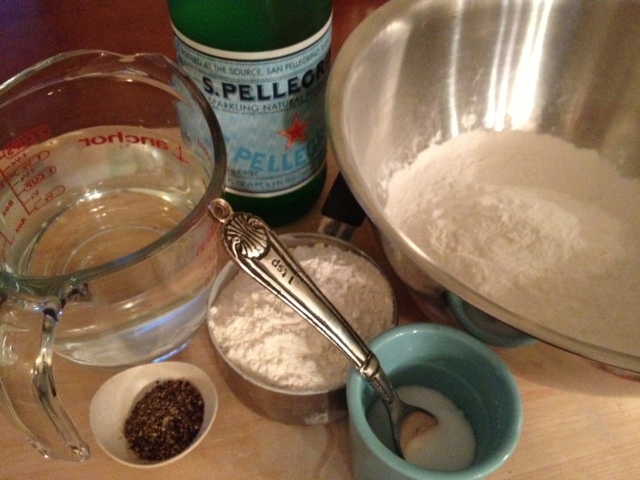 For three cups of All Purpose Flour, you would need about one tablespoon Baking Powder. Maybe this is why April’s recipe failed. The recipe looks fabulous, I can’t wait to try it. Kiki, I made them, and I loved them! I also added a little chopped scallion for color, and didn’t get to have many leftovers, they ate almost all of them for dinner. The leftover pancakes rewarm very well in the toaster, just drop them in like a slice of bread. This is going into the Lenten rotation. Thanks for this recipe. A great recipe!! Just made these extra savoury by adding grated halloumi (salted cheese)! Oh my 🙂 Not lenten though obviously.